The research group focuses on the development and application of methods for long time-scale atomistic simulations. The two main research areas are the diffusion of impurities in the presence point and extended defects (e.g. diffusion of d-band elements in Ni-based superalloys), and the kinetics of phase transformations (e.g. formation of topologically close-packed phases, martensitic transformation in high-temperature shape memory alloys, nucleation during solidification). 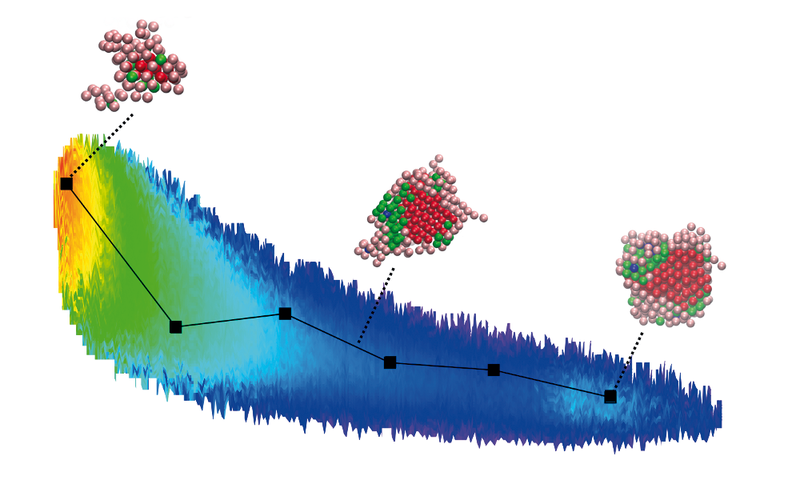 Free energy landscape and optimal reaction coordinate for nucleation in Ni; the initial stage of the nucleation process is characterised by the formation of a precursor zone in the undercooled liquid before the crystal structure emerges from this preordered region; red spheres are fcc atoms, green hcp atoms, and light-brown are prestructured atoms. 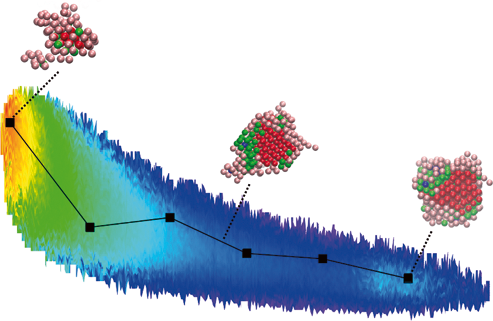 Atomistic processes dominating the long-time dynamics of impurity diffusion, solid-solid phase transformations or nucleation belong to the class of so-called rare events. In this context, rare events comprise processes that require transitions between local minima of the potential energy surface that are separated by sizeable energy barriers. This leads to a separation of time scales between the short-time dynamics within each local minimum (e.g. lattice vibrations) and the long-time dynamics between the minima (e.g. diffusion, structural rearrangements), which makes it impossible to study such problems with classic molecular dynamics simulations. If the dynamics of the rare events can be described correctly based on the underlying atomistic processes, it is possible to follow the time evolution of a system over an extended time scale. Within the group, various techniques such as accelerated molecular dynamics, kinetic Monte Carlo, or transition path sampling are utilised to investigate rare events. 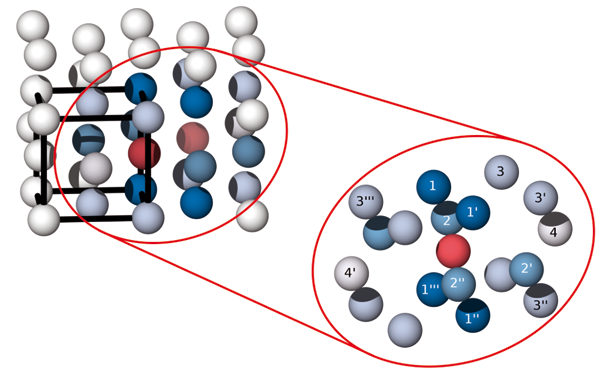 Diffusion channel for a nearest neighbour jump process in an fcc lattice; the diffusion barrier depends on the occupation of the diffusion channel with solute and host atoms; the diffusion channel (blue atoms) contains all first-nearest neighbours to the initial and final position of the diffusing atom (red); the different shades of blue and the labelling indicate the distance from the transition state.